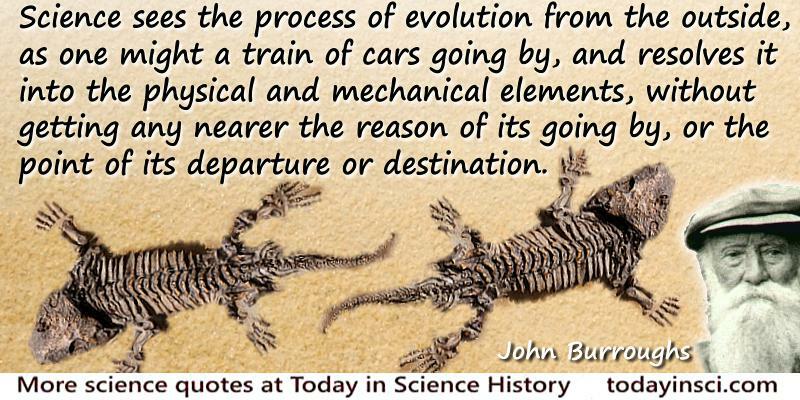 “Science sees the process of evolution from the outside, as one might a train of cars going by, and resolves it into the physical and mechanical elements, without getting any nearer the reason of its going by, or the point of its departure or destination. Intuition seeks to put itself inside the process, and to go the whole way with it, witnessing its vicissitudes and viewing the world in the light of its mobility and in determinateness. All the engineering and architectural and mechanical features of the railway and its train of coaches do not throw any light upon the real significance of railways. This significance must be looked for in the brains of the people inside the coaches and in the push of the civilization of which they are some of the expressions. In like manner when we have reduced biological processes to their mechanical and chemical equivalents, we are as far as ever from the true nature and significance of biology. Science Quotes by John Burroughs.